I apologize to the thread if this turns out to be a double post, but it takes a while to put these turns together and I didn't want it to get lost just because I added to a reply from yesterday. Burden of Time went off without a hitch. No new sites were uncovered and my one random event is a fairly common "get witch gems, be cursed". I bring my new Illusionist back into friendly territory (thanks to buildscharacter for letting me have that), and I pulled in another 14 blood slaves. You'll notice that my blood hunting numbers are anemic compared to the ones Hinnom has been posting, but remember that all I really care about is propping up my dominion and maybe forging the odd Jade Knife or Dowsing Rod. I got two different messages telling me that (in total) 90 of my units suffered badly from Burden of Time. This is going to be an ongoing thing but I'm not going to talk about it much. I already knew that I was not helping myself too much with Burden, but it was the contribution to the anti-Lilli coalition that we agreed to, since my military was not strong or mobile enough to take too many provinces from her. 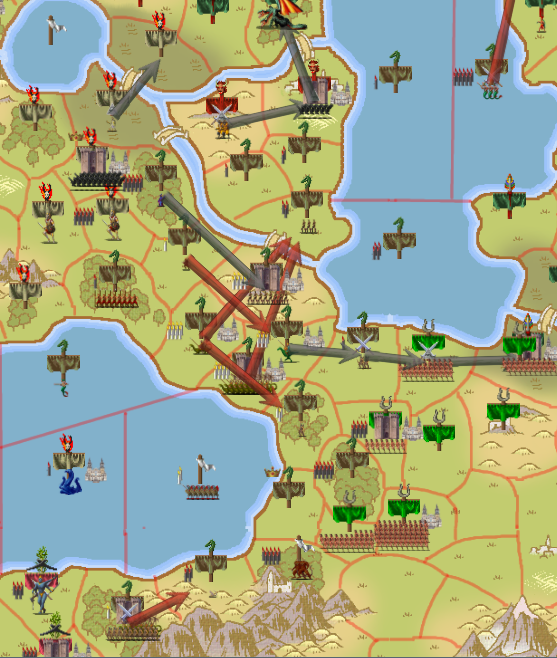 I'm shuffling a lot of troops and commandrs around inside my borders this turn, mostly because it's time that I started paying attention to my infrastructure again. Down in Weald I recruit my first Adept of Pyrophlegeton, although thanks to my own Burden of Time I probably won't be recruiting more than one or two at a time (since they start out old and have relatively low max ages). Whoops! I'm sending a pack of lightly-supported Witch Kings from Weald back toward my interior in order to deal with those Troglodytes, but I leave all of my archers in the fort under the command of the wounded Witch King who picked up that Banefire Crossbow. Before we move on to foreign policy, let's talk briefly about that Wendigo. He starts out at size 2 and over a few months (turns) will grow to size 3, then after another few months size 4, and so on until he is size 6 and very tough. 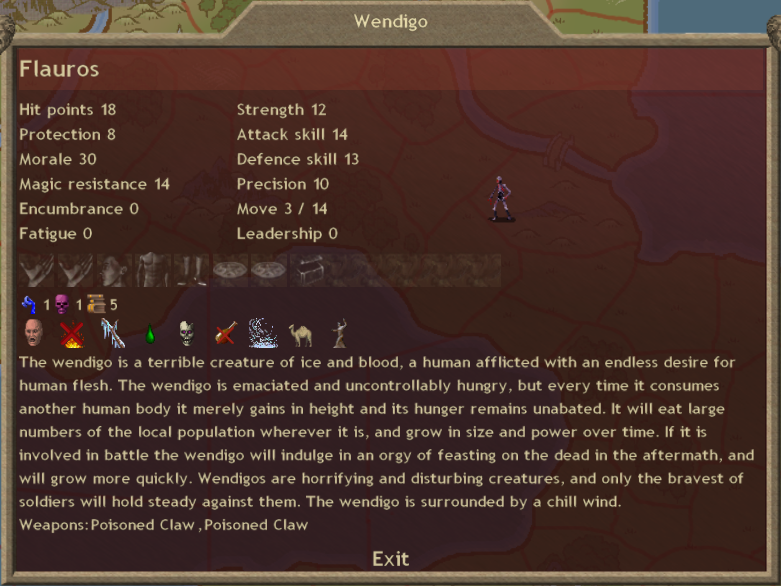 He eats population and corpses in order to grow faster (supposedly, I'm not actually sure how all of that math works) so I send him to the Peninsula of Awesomeness. TheDemon's original plan for that place was to kill everybody off and overtax the arena without penalty. I'm still working on that by summoning ghouls there, and adding a Wendigo to the mix should help tremendously in that effort. Even with the supply of bodies--living and dead--that Wendigo will take a while befor he grows into something truly dangerous. When he's fully grown I'll make a note of it here and give you another screenshot so we can see how long it took and what the end result looks like. Oh, one more thing. We end these domestic reports with a map now, don't we? You can see my Witch King and Merfolk squad continuing northward off the northeastern corner of the map. Their destination is neutral and undefended, so I don't expect any trouble. Speaking of which, how did those two attacks against Mictlan go? Pangaea launched a pretty heavy offensive last turn, and in fact you can see where he has the province bordering mine down in the isthmus. My battle involved a Witch King, some archers, and Pak-ur the Ettin. Unfortunately I put Pak-ur too far back and the casting AI went after the archers first. Leech does 25+ armor negating damage to a whole square, so in round 1 of the fight I lose 3 archers to the Circle Masters defending this province at the cost of only 1 slave. Then immediately after I took this screenshot the other Circle Master did the same thing, so 6 for 2 slaves. 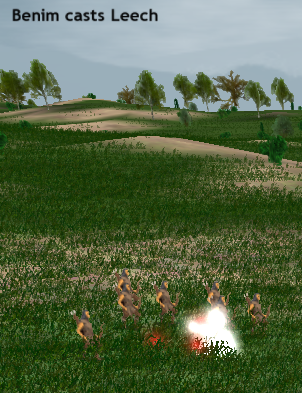 This was only a small squad of archers and the remaining 3 flee as soon as their action comes up. After the that the Circle Masters summon a few Soulless as blockers and then go back to Leeches. The next two rounds take out whatever Amazons I brought with me as blockers, but then after that it's Pak-ur and a squad of about 10 Androphag Archers and a bunch of my skeletons against a much smaller number of Soulless, maybe twenty Mictlan PD troops, and a pair of exhausted Circle Masters without any slaves. I kill one of the mages but the other one flees... since Pangaea took his escape route he dies anyway. On one hand, I kind of screwed that up by not putting Pak-ur far enough forward to serve as a good blood magic sponge. On the other hand, I ended up with the province and cost Mictlan 2 Circle Masters and 15 blood slaves in exchange for about 150 gold worth of troops and about 1 Death gem of summons (I lost one of my last Shades). Even adding in the modest cost of bidding on Pak-ur it's not a bad trade, and the province has a site called The Crypt in the Sand, which gives 1E1D income. Nice. The water province contained a Rain Priest and 7 Ichtyids (one of which was a commander). My forces killed all the ichtyids at the cost of 4 mermen, and the Rain Priest got away. The province has 2 N1 income sites. I got two province with acceptable losses and Mictlan has limited reach back into my territory, thanks to the water and my neighbors. Granted, zmey can fly over Lanka or Pangaea to get to me but chances are that better targets are available. I feel pretty good about the chances of our defensive pact at this point! Oh, right. This is still a thing. The Biggest Poppa cast Enslave Mind on my PD commander in Erfel and won that battle immediately. Still, it cost me nothing and I hadn't really held Efel very long and I don't think I suffered any real losses taking it in the first place. No biggie. There is a fair bit of diplomatic activity going on at this point, but in order to keep everything coherent I will only talk about that stuff whenever I post the results (be they gem trades or province swaps or whatever). Also, buildscharacter will probably have a mega diplo post soon and will touch on some of what was going on in much more entertaining fashion. 4. Extract blood price from Arcoscephale (848 gold).